The 49ers have had their share of signature touchdown passes, whether it was Montana to Clark with “The Catch” or Young to Owens. They now have another pitch and catch to add to the memory banks, Smith to Davis. The final five minutes of the game will go down in history as one of the best as the 49ers and Saints went back and forth. It was San Francisco who would land the final blow when Alex Smith connected with Vernon Davis for a 14-yard touchdown with 9 seconds left to lift the Niners to victory. It was a play that was eerily similar to the Young-Owens play. After the play Davis was overcome with emotion on the sideline as he embraced coach Jim Harbaugh. Smith completed 24 of 42 passes for 299 yards, 3 passing touchdown, and a rushing touchdown. 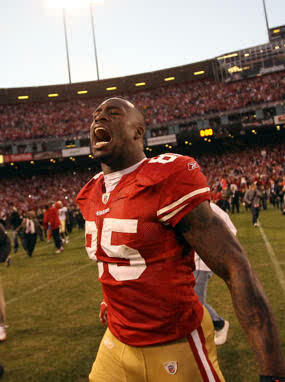 Vernon Davis caught 7 passes for 180 yards and 2 touchdowns. New Orleans Saints quarterback Drew Brees completed 40 of 63 passes for 462 yards, 4 touchdowns and 2 interceptions in a losing effort. Darren Sproles caught 15 passes for 119 yards and a touchdown. Jimmy Graham finished with 103 yards and 2 touchdowns. The 49ers will face either the Green Bay Packers or the New York Giants in the NFC Conference Championship game next Sunday. 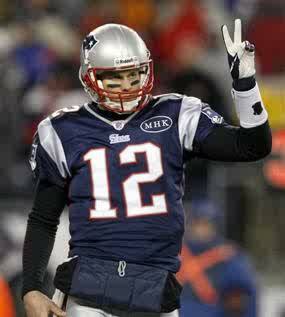 Tebowmania came to an abrupt halt, as Tom Brady and the New England Patriots tranquilized the Denver Broncos 45-10. Tom Brady tied an NFL record with 6 touchdown passes in a playoff game. Five of Brady’s touchdown’s came in the first half, which is a NFL record. Along with those six touchdowns Brady had 363 passing yards on 26/34 passing. 3 of Brady’s touchdown passes went to Rob Gronkowski. Gronkowski finished with 10 catches, 145 yards and the 3 touchdowns. Wes Welker caught 6 passes for 55 yards and a touchdown. Deion Branch and Aaron Hernandez also caught touchdown passes from Brady. Tim Tebow was pressured all day by the Patriots defense and was never able to get going. Tebow finished with 136 passing yards while completing just 9 of 26 passes. The New England Patriots now await the winner of the Baltimore Ravens and Houston Texans game to see who they will host in the AFC Championship game next Sunday.